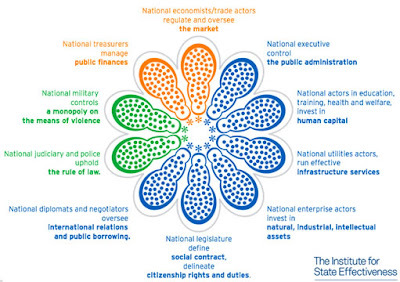 Fuente: Institute for State Effectiveness. Two problems with this schematic. 1) The State must also have a monopoly on money. When barter or other mechanisms begin to replace the national currency, as happened in Russia in the 1980s and 1990s, that means trouble. 2) The State monopoly on violence extends to authorized police and other para-military forces. 1) I need to read the literature that this diagram , but my guess is that the authors are covering this in "National economists/trade actors regulate and oversee the market". 2) Please elaborate on (clarify) your second point. Are you saying that the police must be controled by the stsate and not by the criminals? I think that's precisely what the authors mean. Also, does "para-military" refer to legal bodies such as the police?